Laurier’s Information and Communication Technologies (ICT) is pleased to provide current Laurier students with Microsoft Office 365 at no charge. This automatically updatable, subscription-based software ensures that our students will always have the latest version of Word, Excel, PowerPoint and OneNote, as well as one terabyte (TB) of storage through OneDrive for Business for as long as they’re a student at Laurier and the program continues. This offer is available to all students at Laurier. 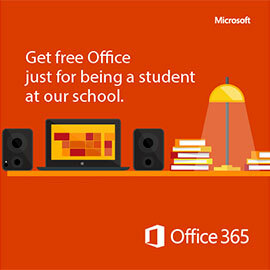 To get your complimentary Office software, visit https://products.office.com/en-ca/student/office-in-education and follow the on-screen instructions. Contact the ICT Service Desk at support@mylaurier.ca or visit install Office on your PC or Mac with Office 365 for installation assistance. You can also access a list frequently asked questions. The Tech Shop in the Bookstore at both the Waterloo and Brantford campuses can also assist you with setting up your subscription for a nominal fee of $10.